Choose between Bargraph, PPM or VU metering strategies. With integral HD/SD SDI De-embedder HD/SD SDI + CVBS inputs, 4 de-embedded Groups, Headphone & Speaker drive, Rack mount in 2U Evolving from the earlier Murraypro EZ-MON, our HD/SD model retains the same popular and robust format, but offers a wealth of new features and enhancements for today's busy TV Professional. “Touch Latch” selection between SDI and CVBS sources ensure that that the EZ-MON HD, with it's comprehensive and cost effective monitoring facilities is at home in Flyaway Kit, Mobile, Edit Suite and CAR applications. The 5" high resolution LCD panel gives a bright clear image, whilst the amply powered stereo loudspeakers enable effortless monitoring, with a headphone output for privacy or noisy environments. A unique feature of the compact 2U, self-contained Murraypro EZ-MON HD, is the choice of 3 different audio metering strategies; select between the Audio Histogram, PPM or VU options. The EZ-MON HD's picture processing switches automatically between SDI @ 1080, 720 & 586, P, SF or I sources, whilst Composite Video 50/60Hz inputs are effortlessly monitored too. Following a source change, a banner is displayed briefly which declares the selected source's detected standard. 'Low Latency' picture processing ensures that images suffer the minimum practical video delay, so that "lipsync" issues (due to the local display) are effectively eliminated. Our video processor provides a reclocked and fully equalised "active loop-through" of the input SDI video signal, which is available for downstream use, and this will often eliminate the requirement for a separate HD-VDA feed to the EZ-MON HD. A high impedance "passive loop" feature is provided on the CVBS input for ease of interface too. All 16 of the embedded audio channels are simultaneously displayed and amplitude monitored on the auxiliary Bargraph LCD. When fitted, this Histogram may be preselected to meter with either VU or PPM ballistics, and with a choice of BBC, DIN, Nordic or VU Graticule. 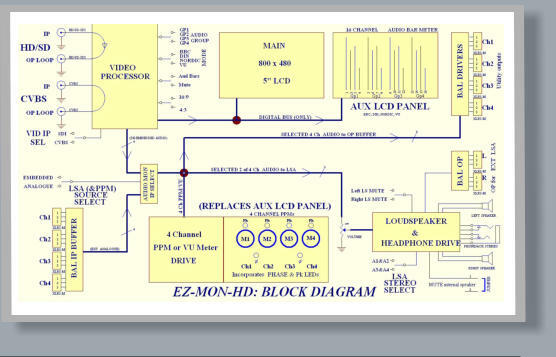 Any of the SDI's 4 audio Groups (of 4 channels) may be selected for loudspeaker monitoring, and an external 4 channel Auxilliary (balanced) analogue Group may also be monitored on the EZ-MON HD, and this is automatically routed when the Composite video IP source is selected. Unlike the Bargraph, the optional PPM or VU metering panels are also fed from this selected Group, and their PEAK LEDs monitor Ch1&2 and Ch3&4 as two stereo pairs, whilst their PHASE relationship is also continously policed too. This "Traffic light" concept is a major feature of all Murraypro's mechanical audio meters, with their ever alert GREEN Phase LED or Peak LEDs snapping to RED immediately any trouble is detected, saving vital time, potential embarrassment and much expense later! Selection between Channel 1 & 2 or Channel 3 & 4 of the selected Group is performed by the front panel switch, and the volume control drives the internal LSA and headphone jack. The headphone drive is current limited, significantly reducing maximum SPL,to provide a measure of hearing protection. An additional fully buffered and balanced stereo OP is available too on XLR-3M for use with external loudspeaker monitoring (an internal jumper is provided to disable the internal LSA). When a 1/4"Phone jack is inserted, the local loudspeaker drive is automatically muted to facitate private monitoring of stereo sources. Fully buffered, balanced 4 Channel audio outputs of the selected Group are available on the rear panel's XLR-3Ms. The 2U EZ-MON HD is totally self contained and does not require externally mounted "wall warts". Mains power is applied, via a standard IEC 320 mains plug, to the fully certified internal SMPSU which accepts inputs between 90~264V @ 47~63Hz. The Ez- Mon HD is Class 1 insulated, and an earthed 3 pin mains supply is required. Power consumption is modest, with a maximum 24W requirement. The unit is provided with a low noise fan too, to promote cooler running in hot operational environments. Outline Specification HD/SD SDI + CVBS 1080p: 23.98, 24, 25, 29.97, 30Hz 1080ps: 23.98, 24, 25, 29.97, 30Hz 1080i: 23.98, 24, 25, 29.97, 30, 50, 59.94, 60 Hz 720p: 50, 59.94, 60Hz 625i: 50 Hz + PAL CVBS 525i: 59.94 Hz + NTSC CVBS Fully equalised & reclocked SDI Looping + CVBS passive loop. 800x480 hi res LCD with low latency processing. 40K Hour, X-140' Y-130', 300cd/M, Tr=15mS. AUDIO Specification Selection of any of the 4 embedded Groups. Fully buffered 4 Ch Group IP on balanced XLR. 16 Channel embedded Audio Histogram metering, or 4Ch PPM Metering with PHASE & Pk LEDs, or 4Ch VU Metering with PHASE & Pk LEDs Pk LED = -10dBFS, >+8.15dBU. Phase red: S=+3dB>M Fully buffered XLR line level balanced OP of selected Group Internal 10W loudspeaker amplifiers & Headphone OP Fully buffered, Volume’d Stereo XLR Monitoring OP Physical Internal 110~240Vac <24W 50/60Hz SMPSU. IEC320 mains input. Class 1, Indoor use. Distortion PF 0.5 2U rack mount 200mm deep <4.5KG. 30'C Ambient. 3000M altitude. 90% RH, non-condensing.